Evidently these copy writers have seen the landfills that are FULL OF TOOTHPICKS! Thanks, Rebekah. You would think it would be difficult to make toothpick that weren't either of those things... Unless of course the little cellophane toppers on the ones in club sandwiches are non-biodegradable, in which case it's worth giving up the environment. Those things are just so damn festive! Not to mention all the trees that are cut down to make them. . . If you're greenwashing, might as well be open about it. isn't there a less confusing way to describe their product, rather than saying round double pointed? how about just "typical"? Does anyone else remember the Looney Tunes (I think) where some character whittled down one tree at a time to make a single toothpick? Maybe it was the Tasmanian Devil -- or maybe not. Good times. 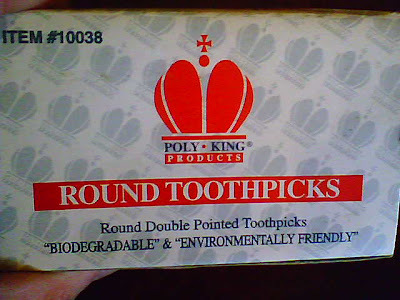 As opposed to the flat-end toothpicks which never decompose?